Quattro is faster than a JCW Mini. It's faster than the Corsa VXR Nürburgring. It's also faster than a Ford Focus ST and nudges the VW Golf R for pace. This is the turbocharged, four-wheel-drive Audi A1 Quattro. 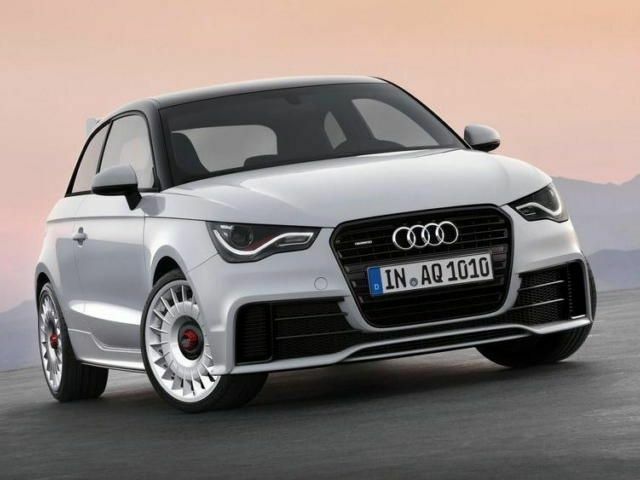 Like a mini Walter Rohrl-shaped gift to the world, Audi has announced plans to produce 333 left-hand-drive models of this, the fastest production A1 ever built. It's destined for mainland Europe for now, but Audi tells us positive customer reaction to this bonkers little thing could see it reach our potholed shores. And that's an intriguing prospect, because it packs 252bhp from a turbocharged, 2.0-litre TFSI unit and 350Nm of torque from between 2,500rpm and 4,500rpm. 0-100kph in just 5.7 seconds, and on to a top speed of 245kph. That's really quick. 30 years of quattro® means 30 years of Vorsprung durch Technik. From the legendary “Ur-quattro” and countless motorsport successes through to the latest generations such as quattro with crowngear centre differential and torque vectoring and with sport differential: quattro permanent fourwheel drive is a born winner – and is systematically continuing its ongoing success story. The name quattro signifies more driving pleasure along with enhanced traction. A sales argument that has convinced thousands upon thousands of drivers all over the world. From 1980 up until the end of 2009, Audi produced around 3.3 million cars equipped with quattro drive. More than 120 quattro versions feature in the current model range. This makes Audi the world’s most successful premium manufacturer of cars with permanent four-wheel drive. In 2010, readers of “Auto Bild allrad”* voted two Audi models the “all-wheel drive car of the year”: the Audi A4 quattro and the Audi A8 quattro. This was the fifth time in succession that the prestigious award went to Audi. A vote that clearly proves one thing: quattro technology today is stronger and more innovative than ever before. The principle is simple, the effect fascinating. quattro® distributes propulsive power continuously between all four wheels. This results in appreciably more traction, better acceleration, excellent cornering and directional stability and outstanding handling characteristics. For even more sporty dynamics, Audi has developed quattro with sport differential. The sport differential is particularly effective in bends. It actively distributes propulsive power between the rear wheels. The result is distinctly more driving pleasure. The extra agility and improved handling are noticeable even in everyday driving situations, not only at the handling limits. · If required, full propulsive power at the rear axle is applied to only one of the two rear wheels. · Instead of braking the inside wheel, more power is directed to the outside wheel when steering or accelerating into a bend. · The propulsive power literally forces the vehicle into the bend. It follows the angle of the front wheels. · quattro with sport differential distributes propulsive power quickly and continuously. It counteracts any move away from the ideal line at the very onset. · Understeer, i.e. the tendency of the vehicle to push wide at the front, is eliminated. · The sport differential is even effective when the vehicle is coasting, for example when the clutch is depressed. The 333 cars are slightly longer than the standard A1, and get the full complement of Audi equipment: S sports seats, quattro badges, dashes of aluminium, Infotainment gubbins, a 465-watt speaker system... you get the picture. No word on price, but expect it to be significantly more expensive than the current range topper, the Rs.17.56 lakh 1.4 TFSI S Line. So, does this turbocharged, four-wheel-drive pocket rocket stroke the parts of your brain responsible for coherent speech patterns, or are you left feeling a bit cold? Speak!